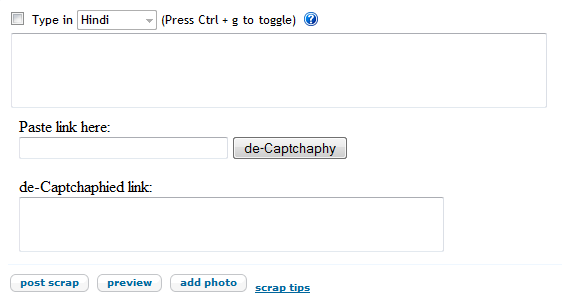 Do you often get irritated of CAPTCHA while posting clickable links to scraps in Orkut ? Frankly speaking I’m completely bored with this thing. But now we have a solution for this. Now you can post links without any CAPTCHA. This solution works on Firefox. Make sure you have Greasemonkey installed. If you don’t have Greasemonkey, you can install it from here. Install De-Captchaphy Userscript. Now navigate to Orkut and see the changes.